It’s not every day that I walk out of an exhibition fighting the urge to cry. But, that’s exactly what happened when I finished a press preview of Adrian Piper: Concepts and Intuitions, 1965-2016 at The Hammer, with curators Connie Butler and Erin Christovale. I’ve always believed context is everything when it comes to appreciating art. With Connie and Erin leading the way, providing backstories about Piper’s politically-loaded work, the weight of Piper’s persistent message that art should be able to eliminate the ways we diminish one another felt heavy. To be frank, I didn’t know much about her work until this exhibition. And so, it seemed all the more poignant that by the time I walked out of the Hammer’s galleries stuffed to the brim with Piper’s paintings, sculpture, photography, video work, and installations, I felt an overwhelming empathy for this woman who spent much of her life screaming for justice in a room full of people who were barely listening. Here is more about works by Piper that still resonate with me, over a month since the press preview. Adrian Piper, “LSD Self Portrait” from The Inside Out. 1966. Image courtesy The Hammer. The exhibition is chronologically ordered, beginning in 1965 with Piper taking a traditional approach to art-making with paint and canvas. In The Inside Out, she explores her own body and different states of consciousness, and how it leads to our personal ideas of the body and identity. These earliest works by young Piper show an eagerness to explore her own spirituality, a river that will run through her work as she leaves painting behind and turns to different media. In 1968, Piper meets Sol LeWitt, largely considered the father of Conceptual Art. He becomes her mentor and friend, and her work moving forward is influenced by his theories. I was intrigued to learn from the curators that Piper attributes her inclusion in the early exhibitions of Conceptual Art in New York to her gender neutral name – she was only included in shows amongst male artists because no one realized she was a woman. In the 70s, Piper had just begun college, where she would study musicology and philosophy, two schools of thought that would permeate her work for decades. It doesn’t take the artist long to arrive at conceptual performance art, the genre with which she is largely associated to this day. Adrian Piper. “Food For Spirit #8”. 1971. Image courtesy The Hammer. One of her first performative series, Food for Spirit, consisted of “private performances,” done only for herself, and documented. She spent two months in 1971 fasting, practicing yoga, and reading Kant’s “Critique of Pure Reason” – so engrossed and determined was she to understanding Kant’s work that she experienced disembodiment. 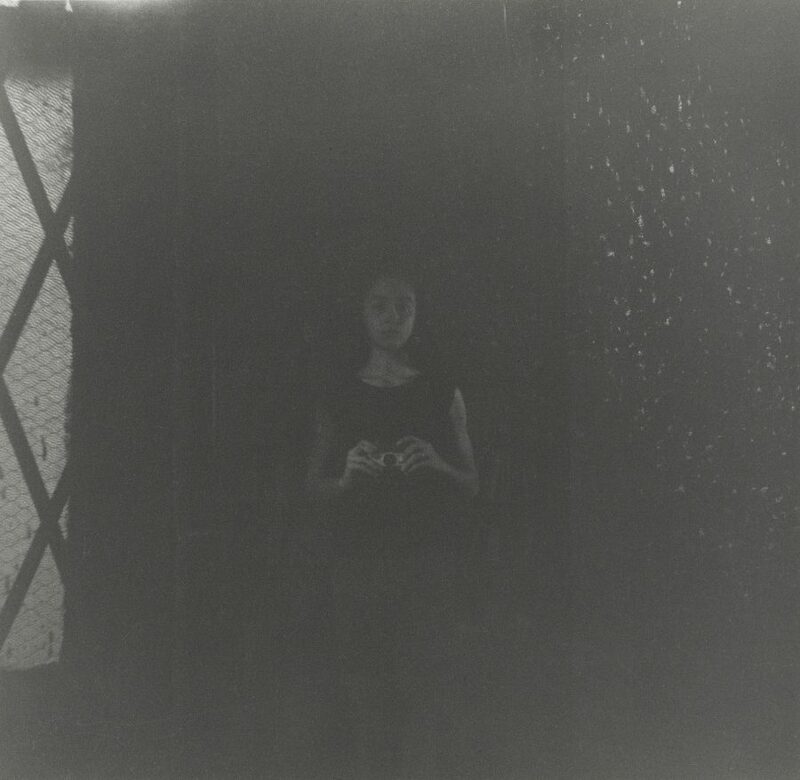 She took self portraits and voice recordings of herself to remind herself that she was still alive and present on Earth. 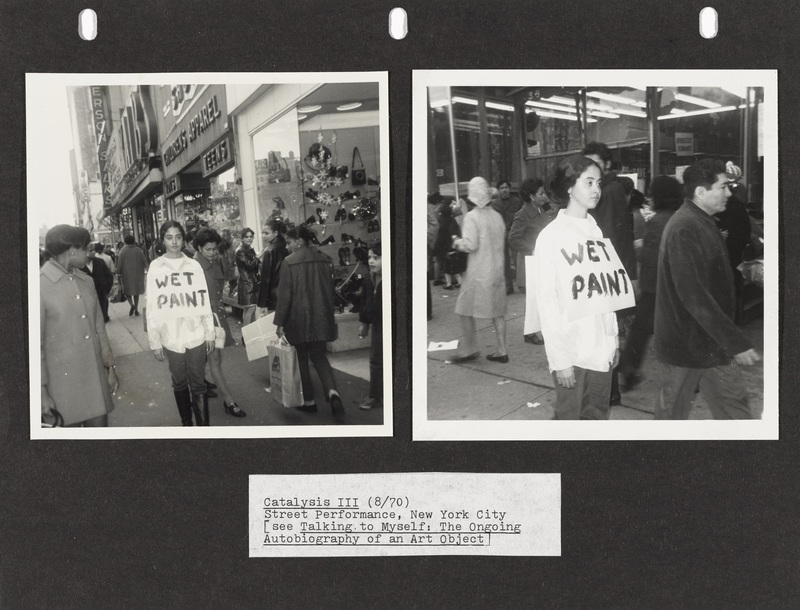 This self-confrontation marked a break in the detachment associated with Conceptual art at the time, and signaled the genesis of her performative self and her use of photography. 5 years into her art practice, she was already breaking the rules of the art world created by men and becoming the radical artist she’s known as today. Adrian Piper. 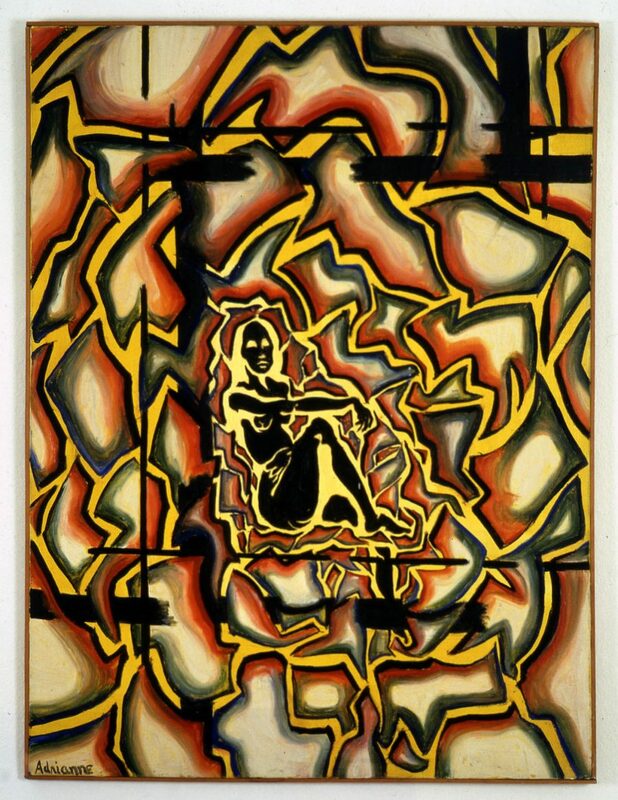 “Catalysis III” 1970. Image courtesy The Hammer. Around this time, she also begins her Catalysis series, taking her art onto the streets of NYC to explore the concept of “The Other”. She does seemingly “crazy” things, like covering herself with wet paint and walk around the city, or stuffing a towel into her mouth while taking public transportation, or soaking her clothing in vinegar, eggs, milk, and cod liver oil for a week before walking around in it during evening rush hour. She created 7 Catalysis performances in which she “Othered” herself, in an attempt to elicit a viewer response. She was beginning to confront the world, but found it often unchanged despite her provocation. I imagine this only propelled her forward, feeding her desire to create art that would help change the world. Adrian Piper. “Funk Lessons – UC Berkeley”. 1983. Image courtesy The Hammer. 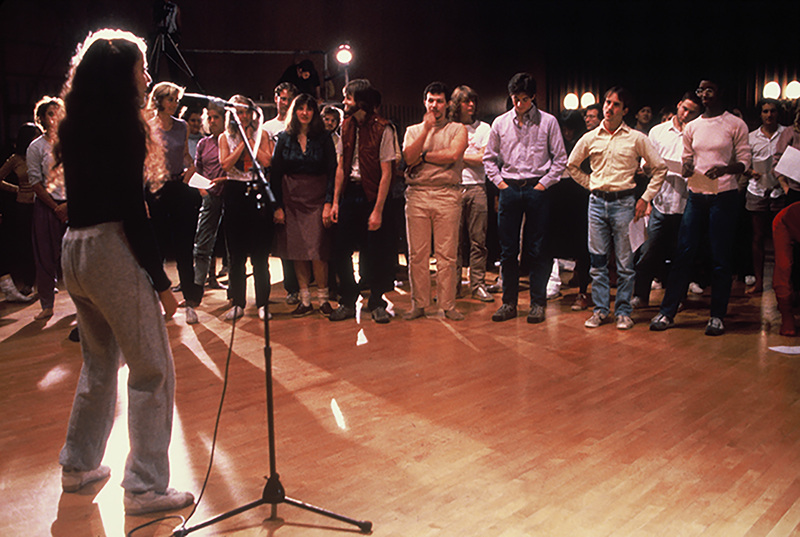 In 1983, Piper begins Funk Lessons, lecture performances as performance art, in which she visits universities to teach students how to dance to funk music – one of the only black genres of music that had not yet been appropriated by white culture. In Funk Lessons, she considers the inherent sexuality of the body, and funk music as a political force to bring people together. This series also marks the beginning of a professorial persona that will continue to appear throughout her work in the future. Adrian Piper’s Calling Cards. Photo by The Art Minion. 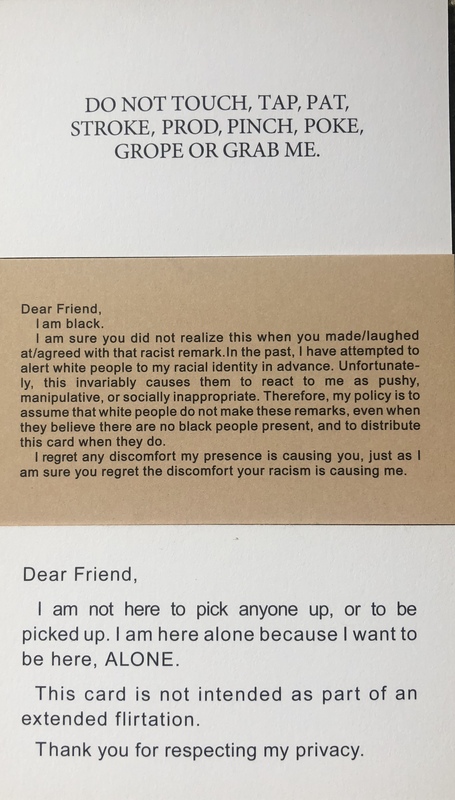 Don’t miss My Calling Cards, three different “business cards,” two of which Piper created in the late 80s, as a means to discreetly and succinctly demand that people to reconsider their prejudiced behavior. If Piper’s privacy wasn’t being respected, or if a racist remark was made in front of her because her blackness was not obvious, these cards served their purpose. I took several, handed out a few, and am keeping a set to frame in my home near the entrance. Installation shot, “Adrian Piper: Concepts and Intuitions 1965-2016”. The Hammer. Image courtesy The Hammer. In 1988, Piper created Cornered, an installation that marks the point when Piper began using digital media to directly address her viewers. She speaks out from a television set, flanked by two of her father’s birth certificates, one certifying him as white, and another, certifying him as octaroon (1/8 black by descent). In front of the television set is an upturned table, representing the confrontational experience that often follows her insistence that we recognize and change the social constructs of racism we all participate in every day. Rows of chairs create a classroom environment, inviting us to sit, learn about miscegenation in America, and think honestly about our own black ancestry. At the turn of the century, Piper begins the series Everything. She includes the phrase “Everything Will Be Taken Away” on a variety of works, at first in an effort to help her cope with her loss of illusions about the United States. When she abruptly moves to Berlin in 2005, leaving the U.S. behind for good, the meaning of the phrase shifts, referring to the process of undoing; letting go of certain constructs and relationships and coming out on the other side. Adrian Piper. “Adrian Moves to Berlin”. 2007. Image courtesy The Hammer. 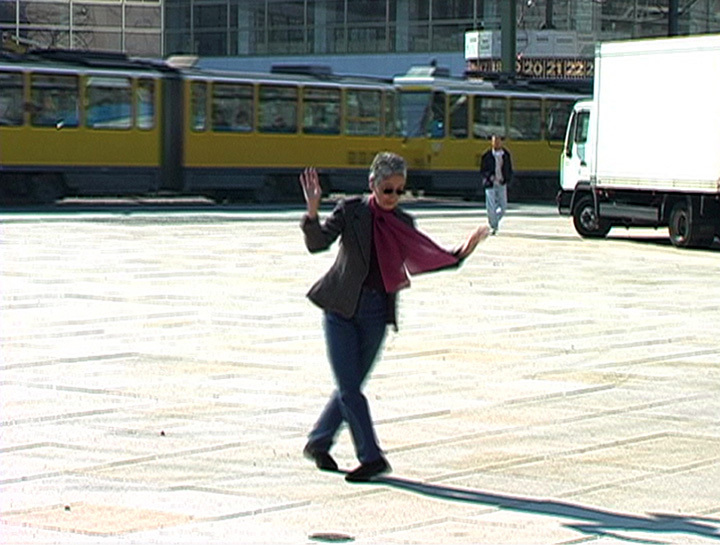 The exhibition ends with Adrian Moves to Berlin, a recorded performance piece from 2007 of Piper dancing alone in a plaza in Berlin; celebrating the fact that even in the midst of having everything taken away, she still manages to find freedom and liberation… in a country far, far away from the divided and fraught United States. Artworks Piper created decades ago feel more relevant than ever, a disheartening sign that the zeitgeist hasn’t shifted much at all. The time is nigh for a wide-spread absorption of Piper’s cautionary tales of gender discrimination, racism, and xenophobia, in the hopes that history will stop repeating itself. Thank god for art, the only vessel by which we might ever have the opportunity to see the world through someone else’s eyes. Throughout her work, Piper invites us to step into her shoes and see her point of view as a woman of color – the situation is bleak, but she believes in our capacity to learn from our mistakes, and to grow. Art will always have the potential to act as a catalyst for change – all we have to do is pay attention. Don’t miss Adrian Piper: Concepts and Intuitions 1965-2016, showing at The Hammer through January 6, 2019. The Hammer is FREE, like all museums ought to be.